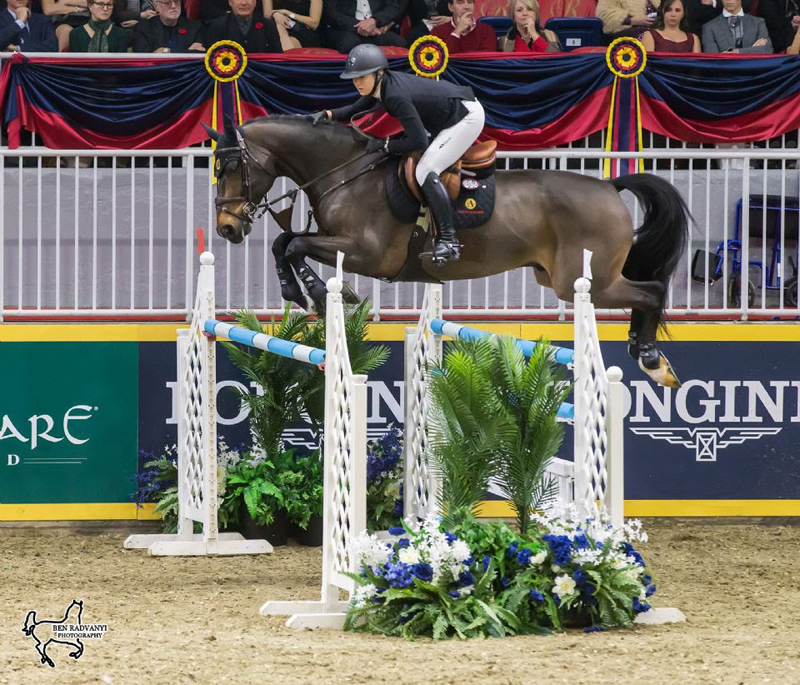 Nicole Walker of Aurora, ON, opened the Royal Horse Show with a win in the first phase of the $125,000 Canadian Show Jumping Championship held Friday, November 2, as part of the 96th Royal Agricultural Winter Fair in Toronto, ON. Speed was the name of the game in Friday night’s $25,000 Canadian Show Jumping Championship, Round 1, presented by Lothlorien. As the final competitor to tackle Irish course designer Alan Wade’s speed track, Walker laid down the winning round, jumping clear in a time of 64.37 seconds with her partner of three years, Falco van Spieveld, a 13-year-old Belgian Warmblood gelding. As the defending Under 25 National Champion at the Royal Horse Show, Walker spoke to her progression from winning in the Under 25 division to winning the opening phase of the Canadian Championships. In a sport where men and women compete as equals, it was another young female athlete, Ali Ramsay, 26, who finished runner-up. Riding Casino, a 10-year-old Oldenburg owned by Ramsay and Angelstone Farms, the Victoria, BC, native also left all the rails in place and crossed the timers in 66.47 seconds. Keean White, 35, of Rockwood, ON, and Leilani left two poles on the ground but their incredibly fast time of 59.04 seconds held up for third place despite having an eight-second time penalty added for an adjusted total of 67.04 seconds. It was a family affair as 12-time Canadian Show Jumping Champion Ian Millar, 71, of Perth, ON, took fourth place with a time of 70.23 seconds riding Calvin Klein for Brookstreet Stables while the reigning Canadian Champion, Amy Millar, 41, also of Perth, ON, placed fifth with a time of 70.63 seconds riding her 2016 Rio Olympic mount, Heros. Following Friday night’s speed round, horse-rider combinations will return in reverse order of standing to tackle the $100,000 Canadian Show Jumping Championship, Round 2, on Saturday night. Walker will once again be the final competitor on course, with the Canadian Championship title set firmly in her sights.